I started using Chunk VNC and desired more functions out of it, like better installation procedures(to avoid UAC problems), more security and better looking GUI. I discussed some of the issues I had in this topic: https://forum.ultravnc.net/viewtopic.php?t=30009. Since then, I started developing it, using AutoIT since ChunkVNC already was using it. I did a small improved version and used here for our team for more than a year. Recently I took on this again and now having the time to develop it, the new client, that Users will run to get support from the Help Desk is done. 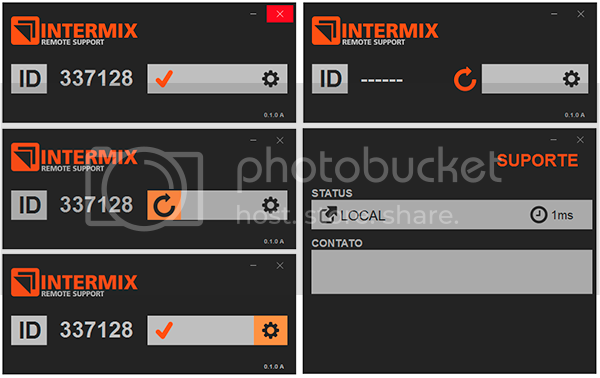 This will be the interfaces your users will open, showing the ID and information on the connection to the Repeater. --- Better installation, with Station and Server mode. The server mode works with a fixed ID and Repeater, intended for access to customer's servers. --- Updated with the latest version of UltraVNC Server and some tweaks in performance I've seen here and tested. --- Can connect up to 4 repeaters for redundancy or if you have multiple customers/companies to support, you can install a local repeater and deploy a CLIENT specific for that network, this reduces the load on having a central repeater for all users. --- Install UltraVNC Server as a service with manual start and stop, with corrected permissions, avoiding problems with the UAC prompts. --- Uses the SecureVNC DSM plugin with certificates, so the data stream is secured between the IT staff and it's users. I'm using the UltraVNC Repeater 2.0, found it's performance better than the Perl Script. I developed a small script to make it's installation easier. 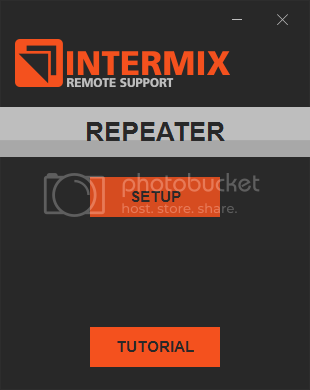 --- Creates shortcuts for the repeater binary, a future tutorial in my repo's wiki and to remove the repeater. It will be scripts to generate the SecureVNC certificates, also to compile the CLIENT and VIEWER binaries to deploy on your Helpdesk. --- Configure and Compile CLIENT binaries according with the REPEATERS you select. --- Configure and Compile the VIEWER binaries with the appropriate connection to databases where the repeater, customer and IT Staff will be. This will be the interface you and/or the IT Pros will use to access the User's systems. In Chunk VNC you had only the field to input the ID and connect, I will go further than that, with authentication so we know who is accessing the user's systems, when and for how long. --- The IT Pro can choose the customer and the repeater before typing the ID provided by the User. A central management tool, that you can configure databases for the Viewer, include or alter customers data, the IT Pros authentication. Also provide reports on the remote access statistics. The idea is to control customers that can receive support, who can provide support and see statistics like how many hours of remote support you provided for customer X, so you can bill them correctly. --- Start the GENERATORs for customer parameters as needed. --- Will run as a Service to authenticate Viewers. "C:\Program Files\ChunkVNC_3_3_1\SOURCE\CLIENT\IntermixClient.au3"(1527,27) : error: handlerCmdLineParam() already defined. "C:\Program Files\ChunkVNC_3_3_1\SOURCE\CLIENT\IntermixClient.au3"(1561,25) : error: verifySetupStatus() already defined. "C:\Program Files\ChunkVNC_3_3_1\SOURCE\CLIENT\IntermixClient.au3"(1585,30) : error: handlerInstalledStatus() already defined. "C:\Program Files\ChunkVNC_3_3_1\SOURCE\CLIENT\IntermixClient.au3"(1614,24) : error: extractTempFiles() already defined. "C:\Program Files\ChunkVNC_3_3_1\SOURCE\CLIENT\IntermixClient.au3"(1650,56) : error: testConnection() already defined. "C:\Program Files\ChunkVNC_3_3_1\SOURCE\CLIENT\IntermixClient.au3"(1712,18) : error: generateID() already defined. "C:\Program Files\ChunkVNC_3_3_1\SOURCE\CLIENT\IntermixClient.au3"(1732,36) : error: vncConnection() already defined. "C:\Program Files\ChunkVNC_3_3_1\SOURCE\CLIENT\IntermixClient.au3"(1828,31) : error: setup() already defined. "C:\Program Files\ChunkVNC_3_3_1\SOURCE\CLIENT\IntermixClient.au3"(2050,24) : error: remove() already defined. "C:\Program Files\ChunkVNC_3_3_1\SOURCE\CLIENT\IntermixClient.au3"(2134,20) : error: closeSupport() already defined. "C:\Program Files\ChunkVNC_3_3_1\SOURCE\CLIENT\IntermixClient.au3"(2180,37) : error: _deleteself() already defined. "C:\Program Files\ChunkVNC_3_3_1\SOURCE\CLIENT\IntermixClient.au3"(2233,49) : error: startProgressBar() already defined. "C:\Program Files\ChunkVNC_3_3_1\SOURCE\CLIENT\IntermixClient.au3"(2279,15) : error: mainGUI() already defined. "C:\Program Files\ChunkVNC_3_3_1\SOURCE\CLIENT\IntermixClient.au3"(2338,17) : error: configGUI() already defined. You have to download the entire Repository AND install the latest AutoIT SciTE, them open SciTE, compile the client source from there, don't mix my source with ChunkVNC because the code is completely different at this point. When the project is done, everything will be done from the CONTROLLER. I've updated the source today with some corrections to make the source easier to read. Also, if you're planning to use the client, edit the files "RepeaterData.au3" to reflect your UltraVNC Repeater config., also the file "textCompanyName".au3" to reflect your company data. I'm testing this as a solution to move to from Chunkvnc. do you have the language files translated in English? also any updates on this project? can it be done from controller yet? how multiple repeater work? if a client is connected to the repeater1 how the IT software know to connect to repeater1 and note to repeater2? I have probleme with my modified chunkVNC and the repeater, sometime the repeater crash and need to be relaunch. If think is to heavy use (40 IT connected at the same time). Your multiple repeater can interest me then. Yod4z wrote: how multiple repeater work? if a client is connected to the repeater1 how the IT software know to connect to repeater1 and note to repeater2? For now the "Client" follows a ordered list of repeaters(1, 2, 3, ...), if the first is not available, it connects to the second. You can set names for Each repeater so the technician can ask the user in which "server" they are connected and use the same repeater to remote in. The app currently checks the Repeater with ICMP packets to detect availability and latency, it also establishes a TCP connection with the Repeater and check the times on that connection. Firts sorry for my english . I try to work on your project in my company. I managed to run the application for the client, but not how to configure the application for the technician, since it has a series of test parameters and storage of information that I can not understand.